SafanDarley has effectively adapted the servo-electronic technology and construction to the segment involving weights up to 200 ton and work lengths up to 13 ft with this model electric press brake. In addition, a strong point of the construction is the level foundation. A balanced combination of powerful electro-motors, fixed and movable rollers and specially developed belts facilitate capacities of up to 200T. In 2006, the E-Brake 200T won both the Techni-Show Golden Innovation Award and the Made In Holland Award. SafanDarley continues to work on new, more efficient solutions under the motto of “the E-volution in sheet-metal working”. The unique roller drive system in the upper beam of the 160-200 T electric press brake, ensures a uniform and even distribution of forces. 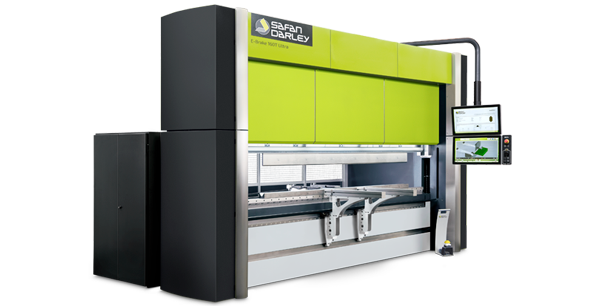 In comparison tests, the SafanDarley E-Brake is shown to be up to 30% faster than a conventional press brake. Cycle times for this product is 20 seconds versus a conventional hydraulic press brake with a cycle time of 35 seconds. The unique roller drive system in the upper beam ensures a uniform and even distribution of forces. A balanced combination of powerful electro-motors, fixed and movable rollers and specially developed belts facilitate capacities of up to 200T. The flexible belts, which are only 0.12 inch thick and 4 inch wide, are reinforced with steel wires and coated with hard polyurethane. The special construction of the SafanDarley E-Brake also contributes to the even absorption of large forces. The O-frame acts as a single unit and deformation is kept to an absolute minimum. It is more stable, stronger and produces less deformation than a conventional C-frame.